In a press conference that was held in Perth following his singles match at the team tennis Hopman Cup, Swiss ace Roger Federer spoke at length of his rivalry with Rafael Nadal. The Swiss great, who claimed the Number 1 berth for a record 287 weeks, found his Achilles heel in his Spanish opponent, Nadal. Federer ruled the grass courts and hard courts and only few could match up to his stride. 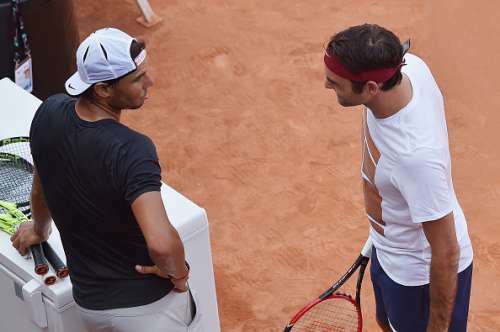 Nadal, undoubtedly, the King Of Clay, always managed to hinder Roger’s easy path to glory with his rippling cross-court backhands which left many stunned. In the press conference, Federer revealed how he has always considered Rafael Nadal to be his foremost rival. The most dominant person on clay and considered the greatest player on the surrface, 30-year-old Nadal always made quick business of the otherwise, tennis great Federer, against whom he shares a 23-11 win/loss record. Federer admited that the consecutive losses on the dirt of clay did get to him as he said, “The way he played or plays against me has always been extremely difficult for me...Plus, I played way too many clay court matches against him. That kind of scarred me.“ Afflicted with a number of injuries due to the intense game style that is charactersitic of Nadal, he had to take a break several times in his career. Starting from the Andre Agassi-Pete Sampras rivalry to the more recent Novak Djokovic-Andy Murray rivalry, the most brutal and arguably the best, is that between Roger Federer and Rafael Nadal. In a decade where Roger Federer had appeared to thoroughly dominate, the mercurial Mallorcan, Rafael Nadal, saw Federer break into a sweat. The pair have, between them, shared the most nail-biting matches in the history of tennis. In a time where Federer was the yardstick of perfection in tennis, Nadal broke in to persuade us to think twice before settling on that opinion. With a head to head statistics of 23-11, Nadal always managed to have his way in their abundant clay court meetings. With an incredible number of 9 French Open titles in his tally, Nadal owns the clay court where Federer with his singular title at Roland Garros has always shown a particular distaste for matches on clay as that surface isn’t one of his favorites. Beginning in 2004, the pair’s rivalry has seen many ups and downs in the two legend’s game. Nadal had always been prone to injuries in his career and had to often take a break from the season to undergo surgeries or recover while Federer did not spend many significant periods away from the court until 2016, when he took a hiatus after Wimbledon. Federer pulled out of the French and the US Open and retired for the season last year. Spending 6 months away from the court is the longest he has done ever since he turned professional in 1997. Nadal, too had to deal with a wrist injury during the French Open which played up again in October and brought his season run to a standstill. This year, Federer is back in the Hopman Cup after a 15-year gap, representing Switzerland with compatriot Belinda Bencic. On the other hand, Nadal, fresh from the success of his win title win at the Mubadala Tennis Championships in Abu Dhabi over David Goffin, is playing at the Brisbane International, with a convincing first-round win against Alexandr Dolgopolov. Although they share a commendable rivalry on-court, their off-season rapport has never been stale. “Now I understand a little bit when guys are injured how hard it is to come back and how much patience you have to bring to the table. It’s not easy and I admire the guys who have done it before me, like Rafa for instance,” Federer said. Recovering from the knee surgery and having taken 6 months off season, Federer has returned with an increased respect for the people who returned to the court, after recovering from injuries. Nadal has always seen success following a return from injury and Federer hopes that his fate would be similar too. He has always proved that the comeback is always stronger than the setback and Federer has decided to take inspiration from it. Nadal, he said, had been his most dreaded as well as the fiercest opponent, he could wish for. “I’ve really enjoyed watching him and it’s been tough against him, so every match I’ve won against him I almost count it double for me.” He revealed his admiration for the Spaniard’s strong sense of professionalism and fighting spirit. Now back on tour, both Federer and Nadal are again running the chances of clashing against each other. With the Australian Open coming up, a wide speculation can be made wherein the possibility of the two meeting again won’t be an oddity. The former world number ones are now farther the top than they have been in some time. And with the ascent of young talents like Kei Nishikori, David Goffin, Stan Wawrinka and other veterans of the Top Four, like Andy Murray and Novak Djokovic, the competition has intensified. Federer, is now out of the top 10 and is currently at world number 16, while Nadal is at number 9 – and both are raring to go! Roger Federer has always personified class and finesse on court, whereas Rafael Nadal had exhibited the fusion of sheer strength and careful planning behind his huge forehands and backhands. The tennis world lived to see a better day, because of these two greats. In his singles match in the Hopman Cup, against Dan Evans of Great Britain, Federer won the match in straight sets exposing his classic style. In the courtside interview, Federer said, “I got hurt filling the bath for my children, it’s not how you want to leave this game.”, when he was asked what gave him the inspiration to keep going. It has been quite a while since he tasted silverware and as he said, “It felt good putting the match shirt back on, and serving first, and then trying to serve it out at the end.”, during his mixed doubles match in the Hopman Cup. Nadal is fresh off his victory after winning in Abu Dhabi by defeating David Goffin, who paved his way to the final by throwing out Andy Murray out of the tournament in the semis, to meet Nadal in the finals. Now, he has taken a resounding straight-sets win over Alexandr Dolgopolov and will play Mischa Zverev in Brisbane. We here at Sportskeeda, long to see Federer and Nadal hit if off against each other once again and resume their glorious rivalry. We wish the Champions a quick way to the top of their game and all the best for the season ahead!